Opening of Queejna/Queen at Västernorrlands Museum. 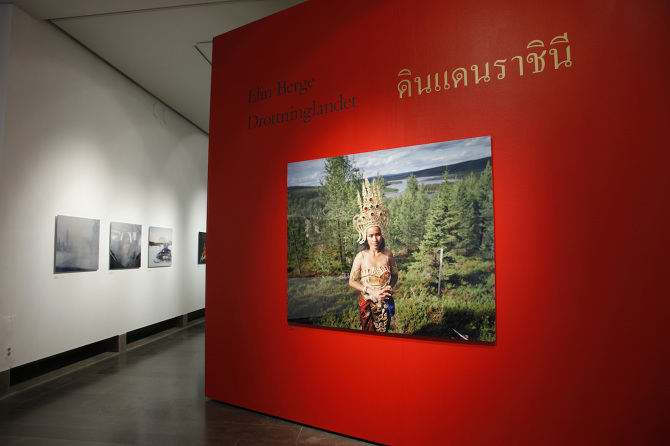 The exhibition Queejna/Queen shows a number of photographic works by Elin Berge taken between 2004 – 2018. The title of the exhibition Queejna/Queen showcases the duality of the word queejna, which the Västerbotten-born writer Sara Lidman used in the meaning of ”woman”. The word queejna can also mean the “queen of the house”, i.e. a powerful woman, as she applied it when she described Hagar, the wild independent woman in the epic The Railway. Hagar was also called ”främmenqueejna”, which, with a postmodern interpretation, can be read as ”The Other”. Berge has with her camera sought to find groups of women that, in different ways, are dealt with as ”The Other”, thus embracing Sara Lidmans term Queejna. Drottninglandet at Hasselblad Foundation, Gothenburg. Elin Berge has devoted several years to documenting the destinies of a number of Thai women who live in northeastern Sweden. These women live under different conditions and are in different phases of their lives, but have one major factor in common: they all moved from Thailand to Sweden to live with a Swedish man. Elin Berge has carried out her project in close collaboration with Swedish composer and vocalist Frida Hyvönen. The first part Drottninglandet (The Land Of Queens 2009) was produced as a touring exhibition by Hasselblad Foundation and has been shown in Sweden, Norway and Lativa. The second part Kungariket (the Kingdom 2015) came together with the first and created the new exhibition The Land Of Queens with selected works from the both series. Slöjor at Galleri Kontrast, Stockholm. Slöjor (Veils) was Elin Berge’s first solo show. It premiered at Galleri Kontrast 2006 and has since then been exhibited at over fifteen galleries or institutions in Sweden and Italy. The photographs show young Swedish women expressing themselves with their clothes. The viewer gets to meet women in young trendy outfits combined with chic veils in pink, baggy style matched with white sporty veils, or traditional black niqabs. There are girls from different backgrounds, and with different opinions about how a veil should look and why it should be used.